The Majesty of Colors is a very short but moving game by Gregory Weir which features the player as an abyssal sea creature come to explore the strange and wonderful world that lies above the ocean. Players deal with situations that arise in the creature’s time at the surface, and the choices you make dramatically affect how the land dwellers react to you in subsequent segments. The actions you take eventually lead to one of several endings, each of which caused me to think differently about the people affected by what I had done. It’s visually and aurally minimalistic, with simple graphics and a soundtrack made to mimic the sea. 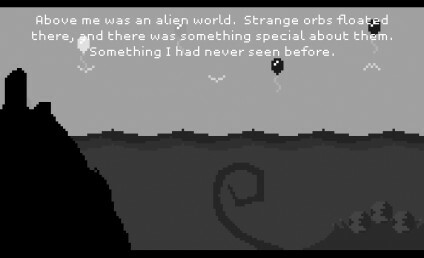 This creates an experience to be interpreted; the characters involved consist of nothing more than several pixels, yet you feel for them, and I find that really compelling. This has been around for a bit, so if you haven’t played it yet, seriously, get to it. It only takes a few minutes to complete entirely and is well worth each one.